Triangular shapes are everywhere in Nature. They show up in geology, biology, chemistry and physics; from the sub-atomic scale to the cosmic. But is it significant? Connect any three points and it makes a triangle - it's hard to avoid. Triangles are bound to appear in Nature, because it's ... well, natural. Or is it that simple? Triangles emerge in fractal geometries, where they repeat at different scales. It's as if there is a common denominator influencing the process. The finest examples are ones most difficult to reconcile with accepted theories. Good lord, there's triangles everywhere. Not kinda triangular, but sharp-edged and consistently angled, that repeat, over an over. It's amazing, really. And to think this could happen from millions of independent, random forces acting over millions of years. It's a wonder. 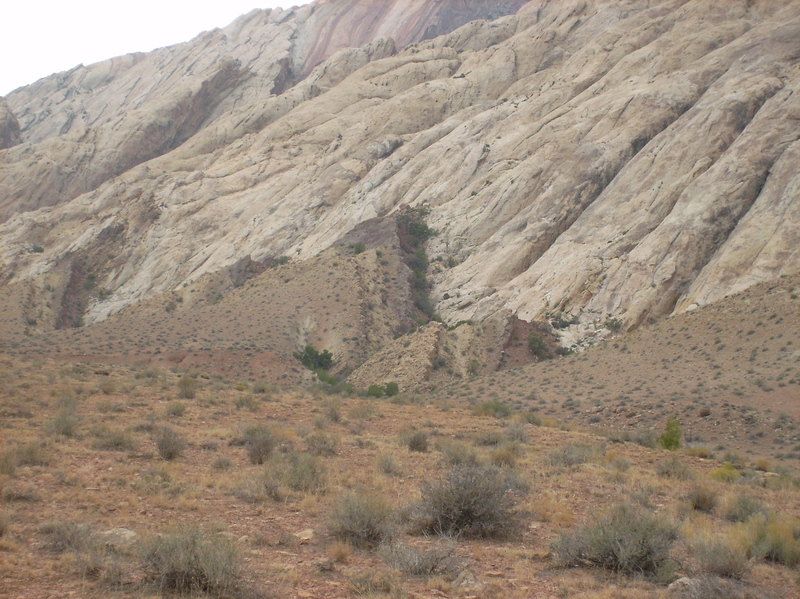 Geologists say the cause is mainly erosion. Water follows faults, and cracks, carrying away soil, and rock. 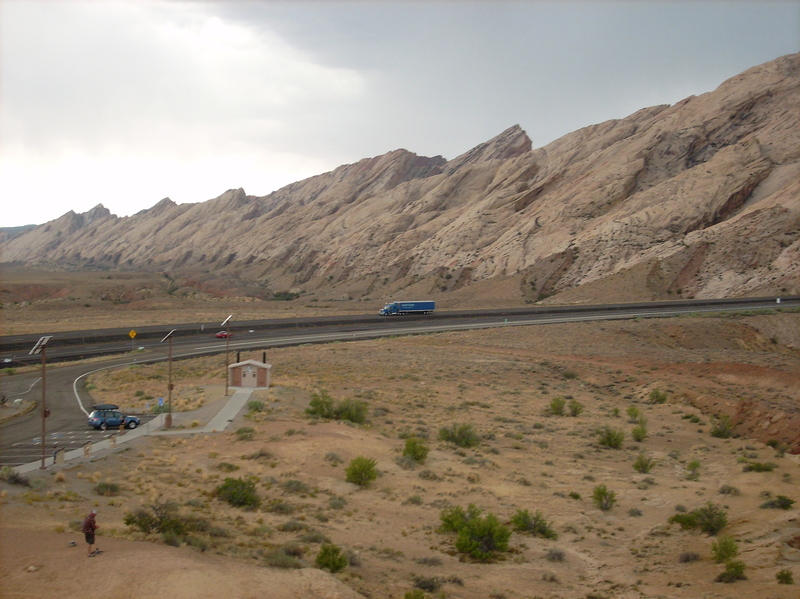 Rain collects into runnels, that collect into streams, and funnel into ever narrower channels of flow, leaving triangular pyramids between canyons. It's that simple. But is this true? Doesn't water flow straight down, obeying the imperative of gravity? 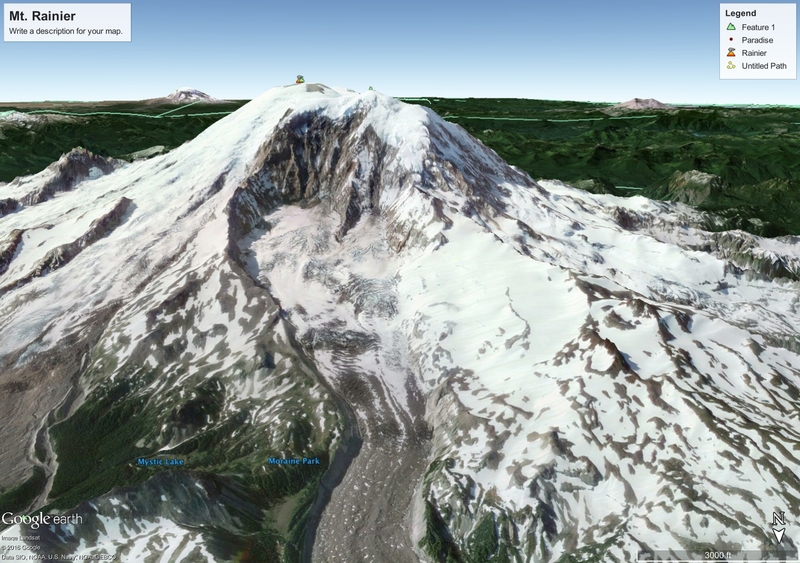 Take a look at these volcanoes. 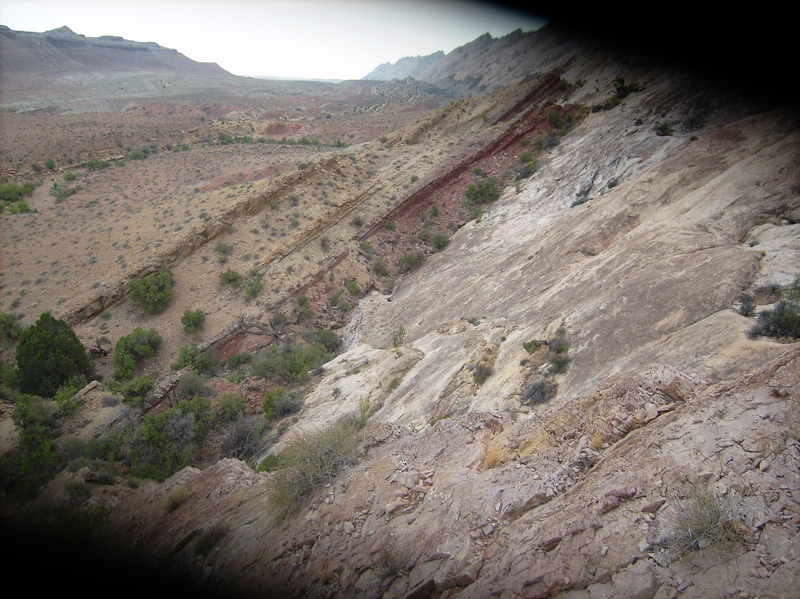 Their flanks are no different than mountains, and they certainly show water erosion. No triangles, though. 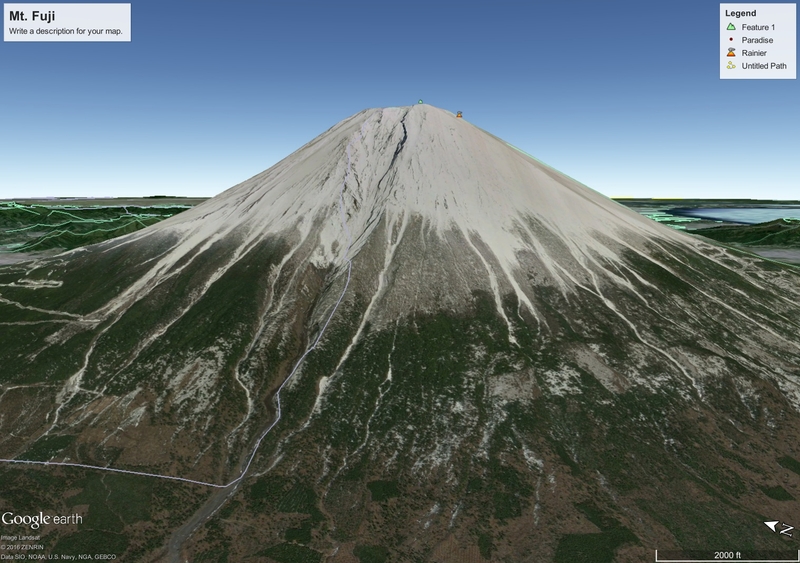 Except for the conical shape of the volcano itself, triangles don't appear. Just chaotic, flow patterns that basically squiggle straight down. 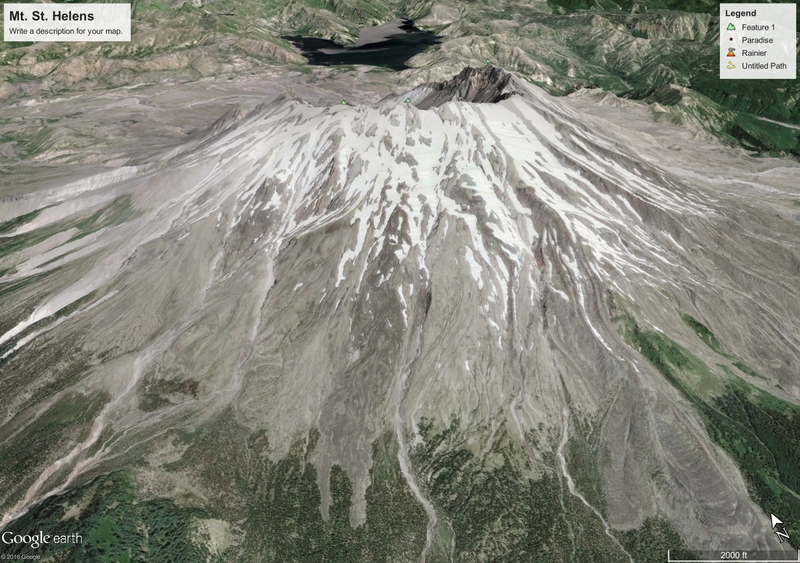 Perhaps it's some property of mountains that volcanoes don't share. 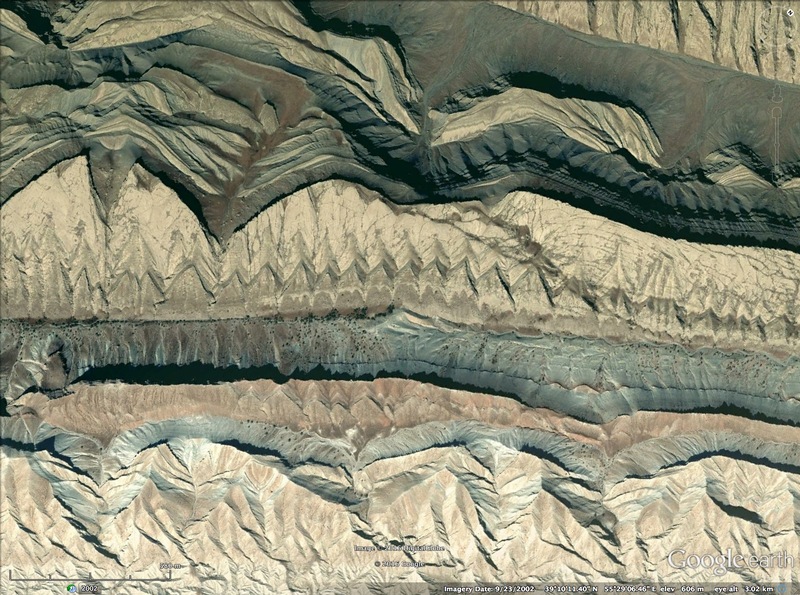 Linear alignment of faults that direct the water to produce a regularity in form ... maybe? But that can't explain the triangles in the next pictures. Just look at the rock behind the triangles. It's pocked and uneven, twisted and tortured. So, how could water flow in any regular way to carve the neat, little repeating triangles below? Close-up you can see the triangles are mostly soft dirt sediments laying on hard sandstone rock. They should have eroded away millions of years ago. Yet here they sit in a neat, tidy row along the base of jagged, rocky slopes. 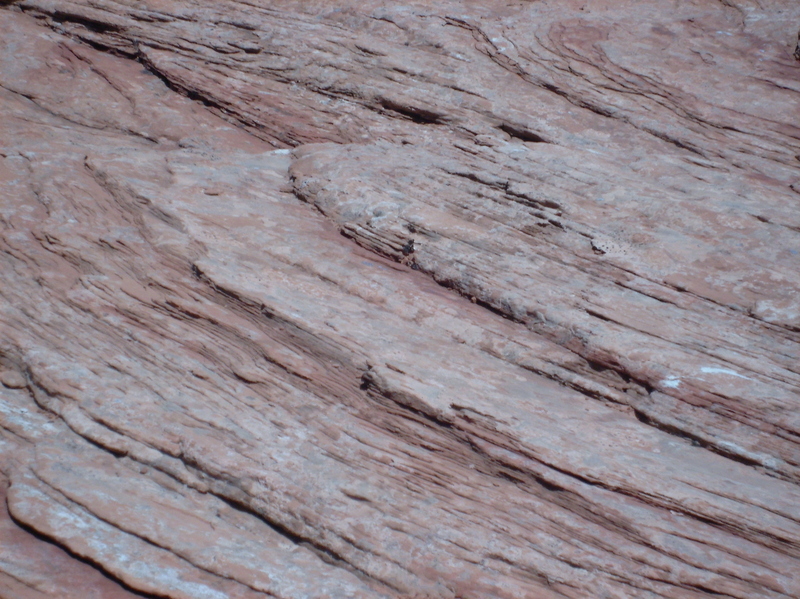 The triangles are evenly layered and cut straight, yet the rock underneath is uneven and convoluted. There doesn't appear to be evidence of water flow at all. 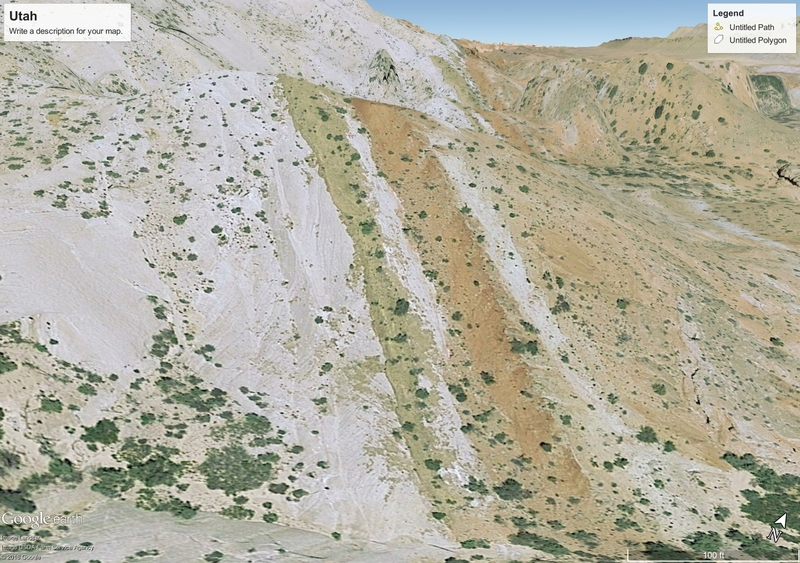 The triangles aren't piles of dirt fallen from the slopes above, either. 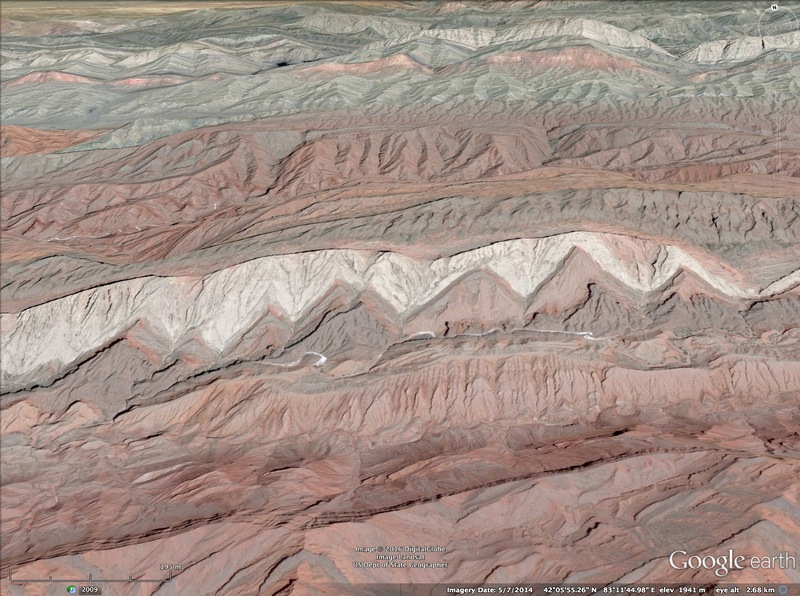 They are clearly layered at the same angle throughout, with hard layers sandwiched between layers of soil. The soil is not even the same color. A rock slide couldn't do that. Look at something even stranger. 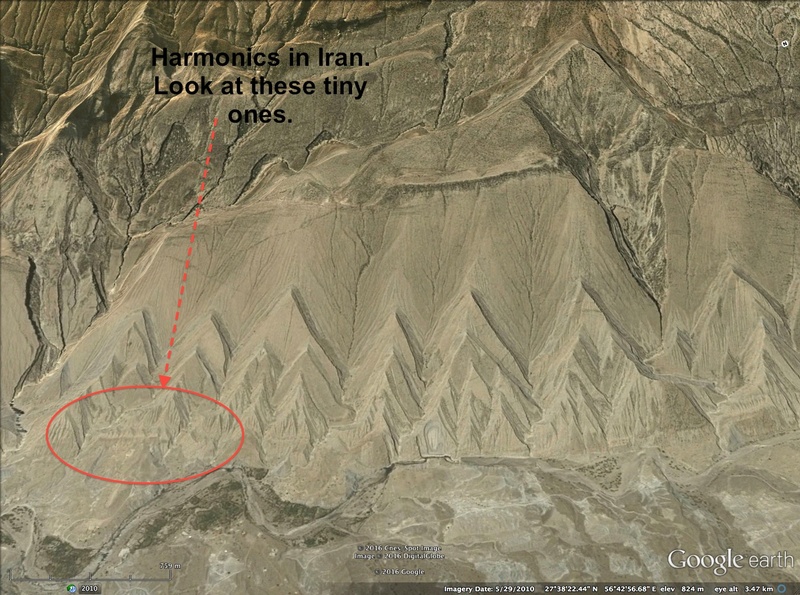 On this mountain in Iran, triangles repeat in harmonics. The triangles are layered on one another, with the outer ones repeating the form in harmony - where two, three or more triangles repeat inside the form of the previous triangle. I circled where seven tiny ones formed across the base of a larger one. Harmonics displays itself often on the flanks of mountains of every type of rock, from sandstone to granite, everywhere in the world. They appear in rows, spaced precisely like wavelengths, their amplitudes rising and falling in geometric progression in nested, harmonic triangular forms. It's as if they are wave-forms. In fact, every aspect of their appearance relates to sonic waves. They appear in harmonic frequencies, with wavelengths and amplitudes that vary in proportion, and they are always layered in place, the stratification angled with the face of the triangle. It's odd that the faces are flat, too. They should be humped and rounded if made by erosion. It's as if they were layered into place during some coherent event, with new wave-layers breaking into smaller harmonic repetitions of the wave-form as time progressed. This is something sonic waves do, too. San Rafael Reef, Utah - photo by Andrew Hall Finely layered sandstone on Comb Ridge, Arizona - photo by Andrew Hall. Sometimes mountains can be absolutely crazy, going beast-mode with the triangles. Look at the following pictures, and there is only one rational conclusion to draw. 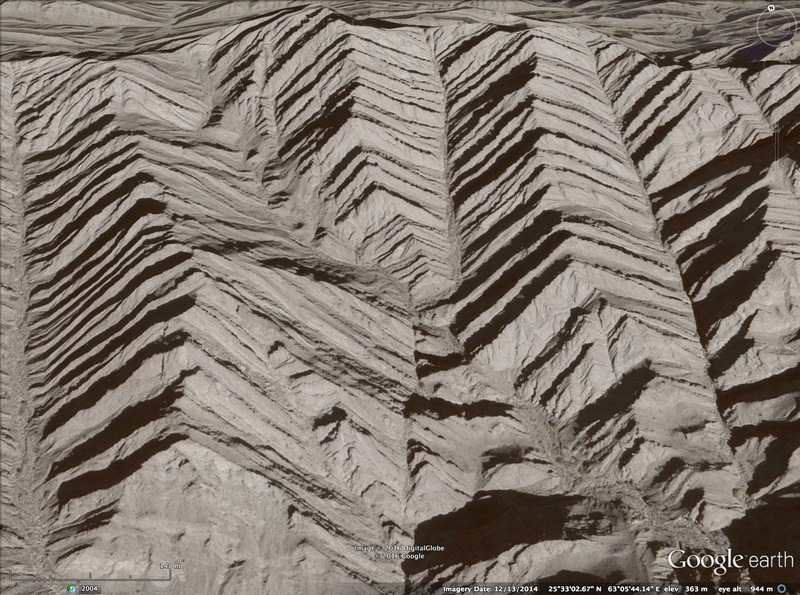 These were made by coherent forces, not random erosion over time. 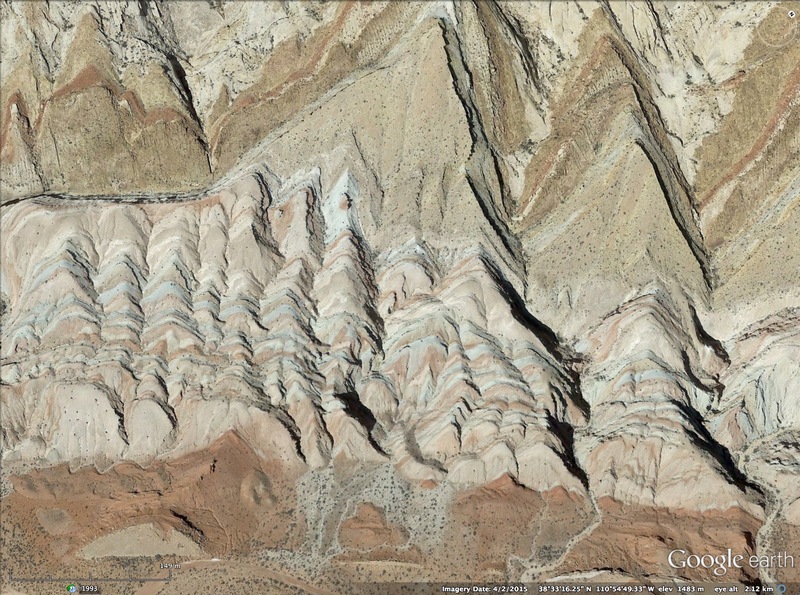 Just look at the images and it's clear something fundamentally different from mere erosion occurred. There is some common denominator in the equation for mountains we are missing. In fact, there are too many wave-like features to be coincidence. There is the repeating fractal form of the triangle itself, with consistent angles. Consistent amplitudes relating to specific layers, suggesting a time sequence to their formation. Wavelength, frequency and amplitude maintain consistent ratios. 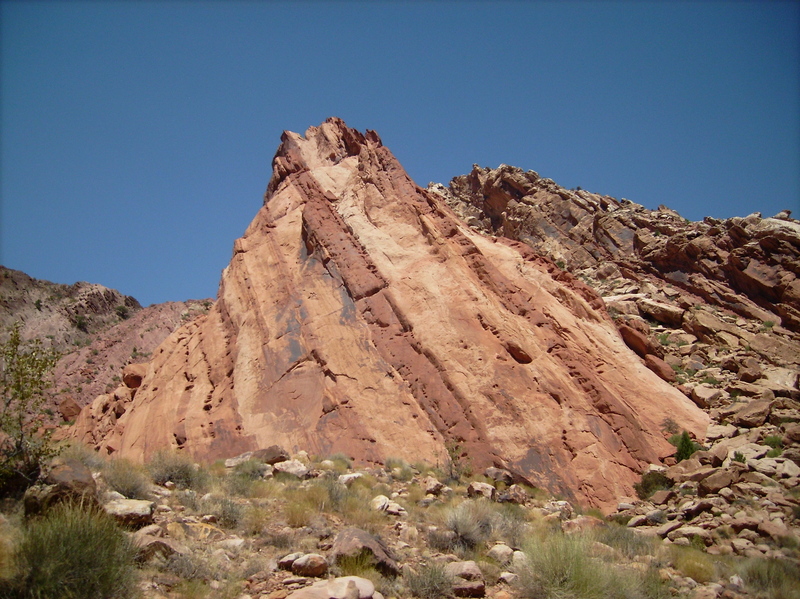 And they appear regardless of the type of rock, in ordered, stratified layers. Not only that, the wave-forms express compression and expansion, interference patterns, and repeat in nested harmonics. 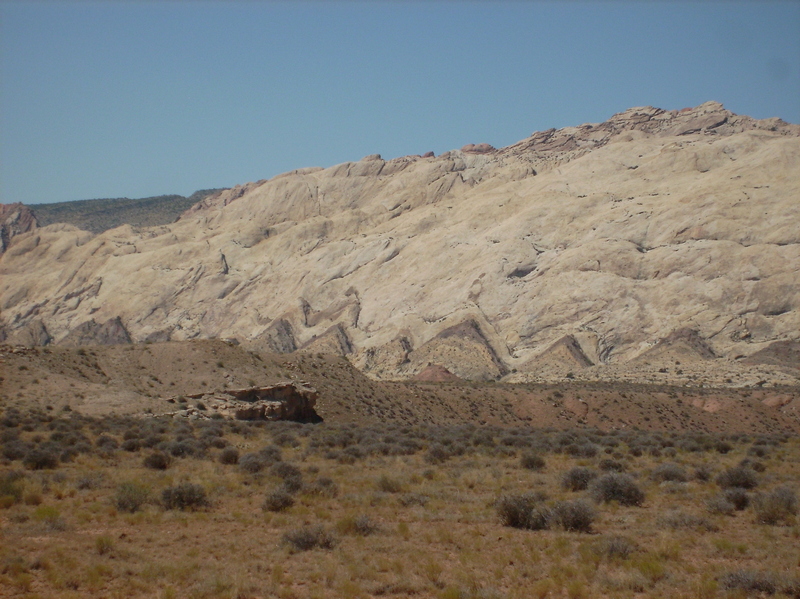 And there is obvious coherence across grand landscapes. The evidence defies all commonly accepted theory. There is a logical answer, however. 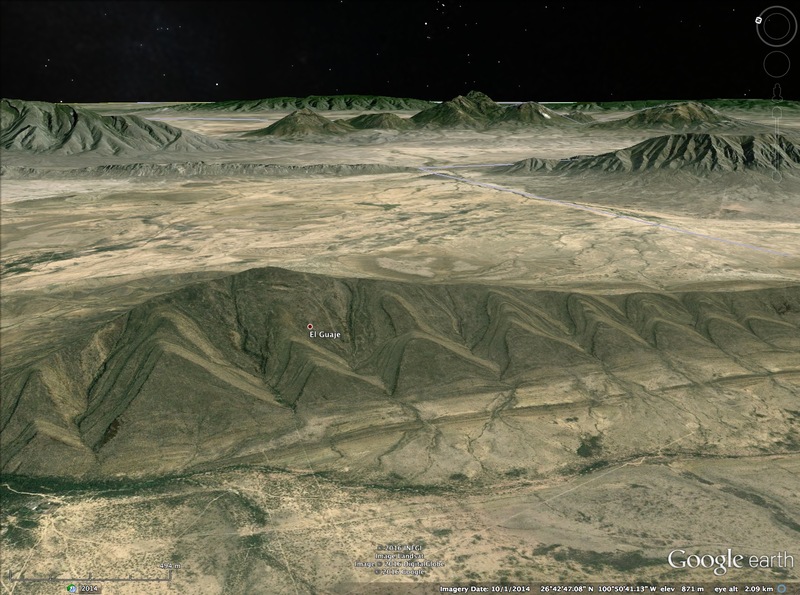 There is a rational, physical explanation why mountains have triangular flatiron flanks. Unfortunately, it has nothing to do with water erosion, earthquakes, or millions of years. It has nothing to do with plate tectonics. In fact, the answer disputes almost everything taught in school. It has to do with the wind. I'm not talking about the wind as you know it. I'm talking about a primordial wind of super-sonic velocity, that generated shock waves and carried electricity. That is why these features appear with patterned perfection. 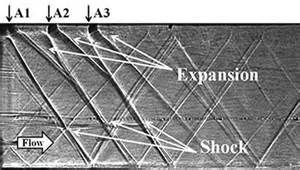 Shock waves create triangular patterns. 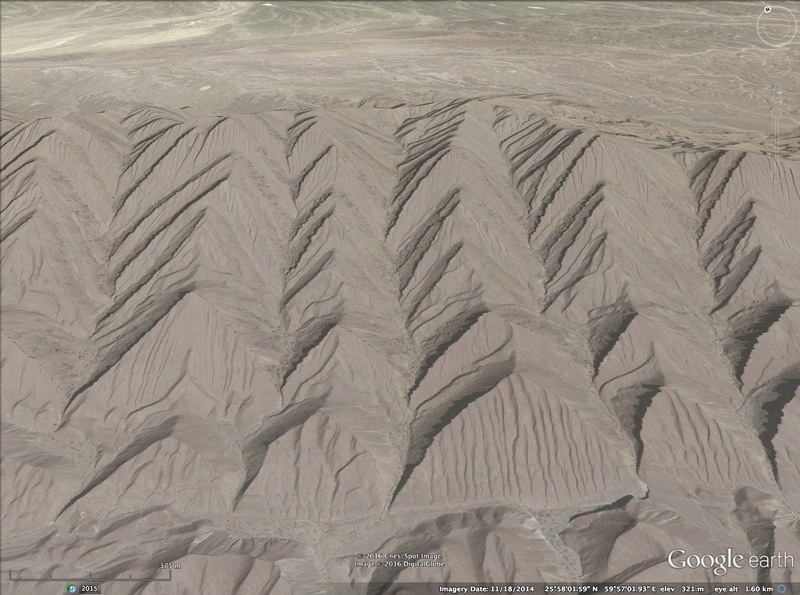 The mountains didn't erode into these shapes, they were built into these shapes, like sand dunes in the wind. In fact, except for volcanoes, sand dunes are the only mountain we see made - by the wind. Bullet impact creates triangular shock wave reflections. Supersonic wind produces triangles in standing, reflected waves. The face of Earth was once scoured by weather like Jupiter's, with winds that exceeded the speed of sound. Triangles are prime evidence. Supersonic wind creates standing waves of pressure and rarefaction that take triangular form as they reflect from obstructions in the wind flow. 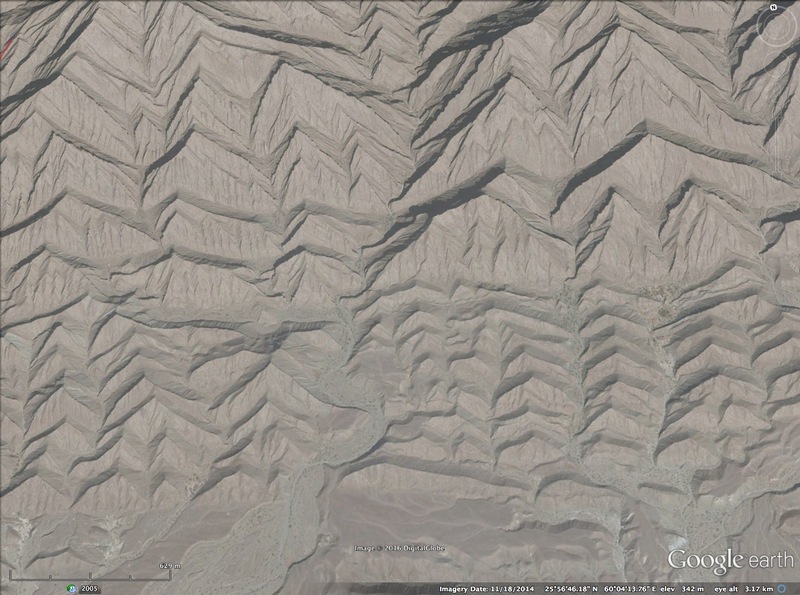 Obstructions like mountains - so the windward flanks have the triangular shape of shock patterns embossed on them. 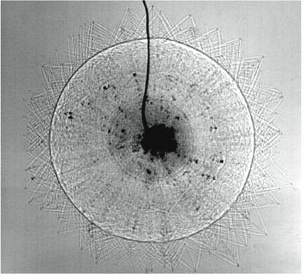 Shock diamonds produced by supersonic flow in a wind tunnel. The atmosphere was also heavily ionized, and the dust it carried obeyed electric fields, welding and electroplating the landscape like a plasma torch. 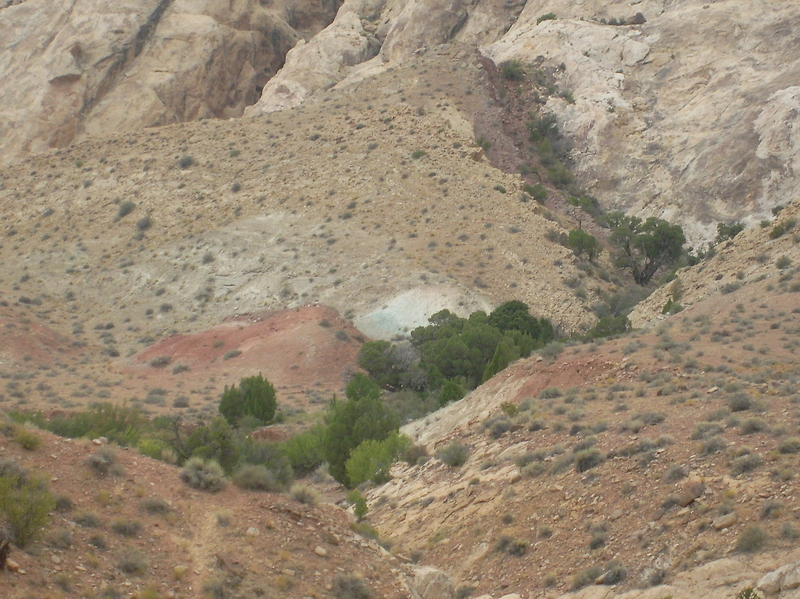 Mountains were created in such a primordial environment. That's why they line up in linear arrays, like dunes. That's why one face is steeper, like a dune, and the other slope - the windward side, is shallow, flat and displays triangular features. That's why volcanoes, which were formed by eruption and not winds, don't display triangular features, and water erodes channels straight down their slopes like it's supposed to. None of this is implausible. We see tornadoes produce winds of 300 mph. That's roughly half the speed of sound. So, it's entirely possible winds on Earth reached two, three, or more times that speed in the past. And ionization and electrical current is already in the atmosphere. The highest winds are produced by tornadoes in electrical storms, where the electric field grows to hundreds of millions of volts above normal. Enough to create the giant sparks we call lightning. We actually see all the conditions in our weather to produce a mountain, except the extreme severity of wind speed and ionization. But we do see those conditions on other planets. Jupiter and Saturn swirl in dynamic cyclones of ionic wind that reach supersonic speeds. Venus' atmosphere is a constant electric storm, with lightning thousands of times bigger than we see on Earth. If we can see it happening on our neighborhood planets, that's good evidence it could have happened here. 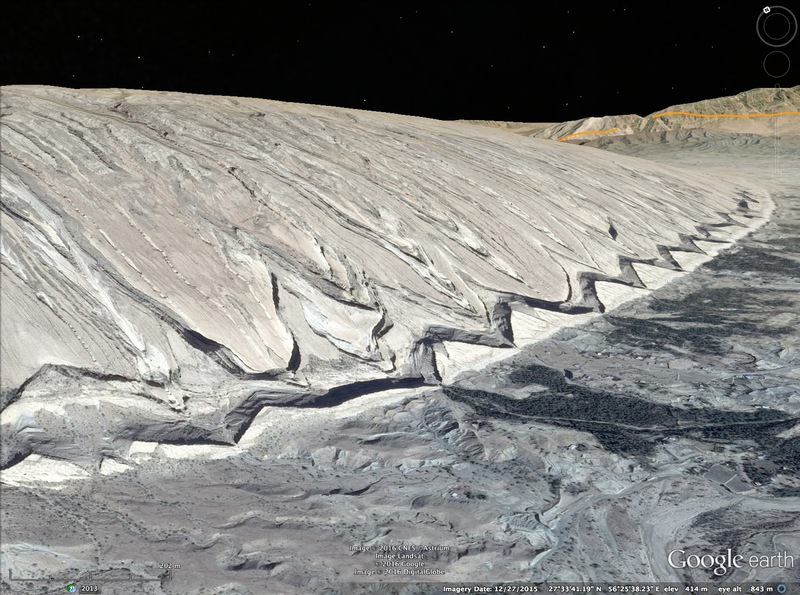 What we don't have evidence of on other planets, is plate tectonics. Oh well, there isn't much evidence on Earth either. It's the narrative that won't go away, built on unverified assumptions that we've been taught to believe. The truth is, we don't even know what's inside the Earth past the few miles of crust we've drilled through. We don't know what causes earthquakes, volcanoes, or mountains to rise and fall. We don't know if mountains rise and fall, at all. All we have are a bunch of assumptions about what happened long ago. What the landscape shows doesn't look like the theory we are taught. 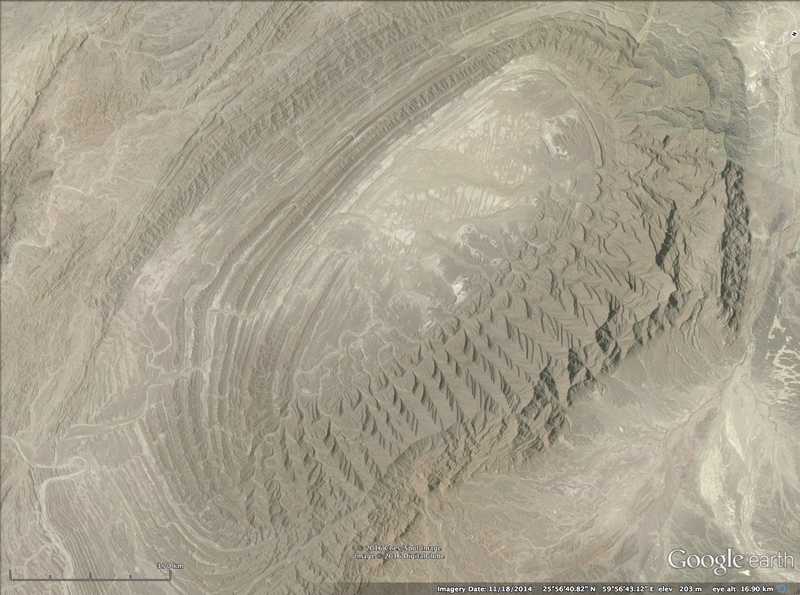 It looks like something completely different shaped the land. Alternative ideas abound, but mine is the only one that explains the triangles. Since we live on this planet, our minds should be open to what it tells us. There is more than triangular shapes on mountains to comprehend. If your interested in learning more, visit my website, The Daily Plasma. Before we end, here is a bonus. 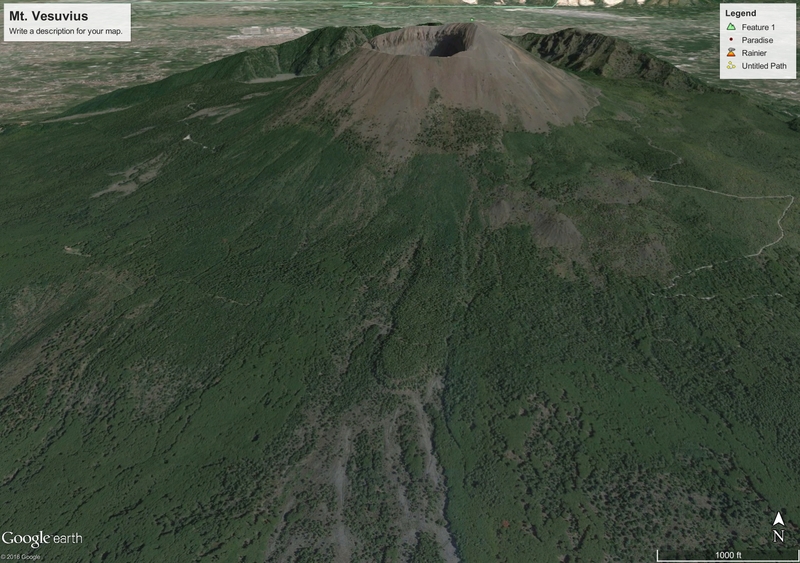 Sometimes you can find triangles on volcanoes if you look inside the crater... Can you say why? Please leave a comment. ‹ Why Schumann resonance occur? Man, am I glad to see you here. Yes! But damn you, Andy, you got me so full of questions by now I'm having to educate myself all over again. As I see folks like yourself articulating your deepening understanding of these matters and bringing it back to the trailer park in good English and good pictures, my eyes shift to what I guess you'd call the project management aspect of getting this information into the bloodstream of our global research capability in time to tune the next catastrophe like a radio dial before it happens... if you get my drift. I can watch your presentations a lot and I do. But how do we get NASA to invite you to give a presentation that some guys will see who sign research grant checks... for example. When's Wal going to get invited to tell the UN why we need to spend money on figuring out how best to live within the circuitry that we are part of right down to our battery packed organ systems? Very interesting. I quite enjoyed this. Magnets, sound waves and electricity all have patterns so I see the point. Perhaps another avenue to check out is the matter of the stone itself and whether it's structure could contribute. 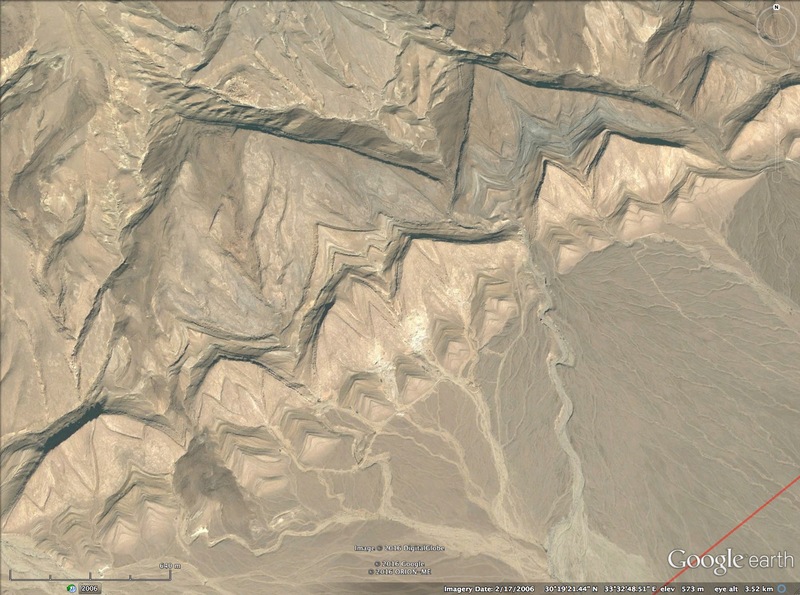 Triangular patterns are in the Himalayas too. 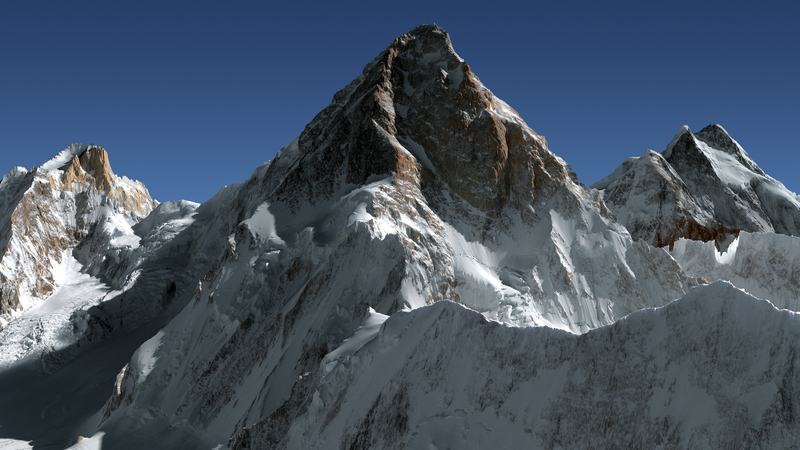 The top third of K2 is surmounted by a ridge-cascade of triangles ranging from large at the bottom of the triangle features, to smaller and smaller as we go up in altitude on K2. I get the intuition that these triangle forms were created from above, not from the side. 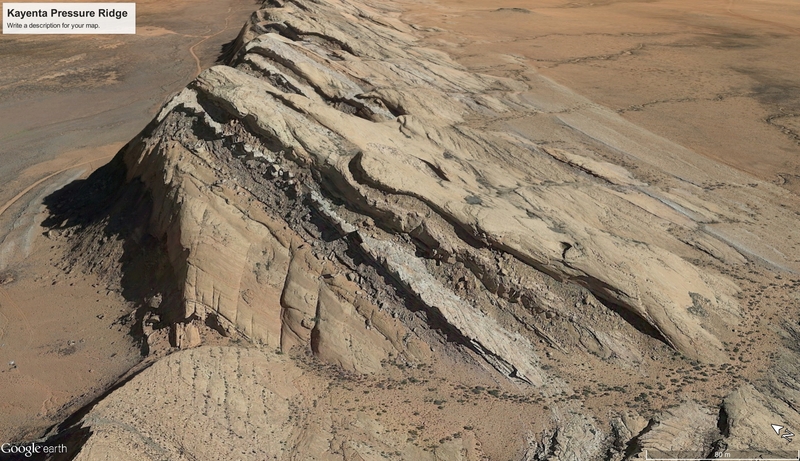 Probably there are other examples of top-down small-to-large triangular rock-formations, elsewhere in the world. 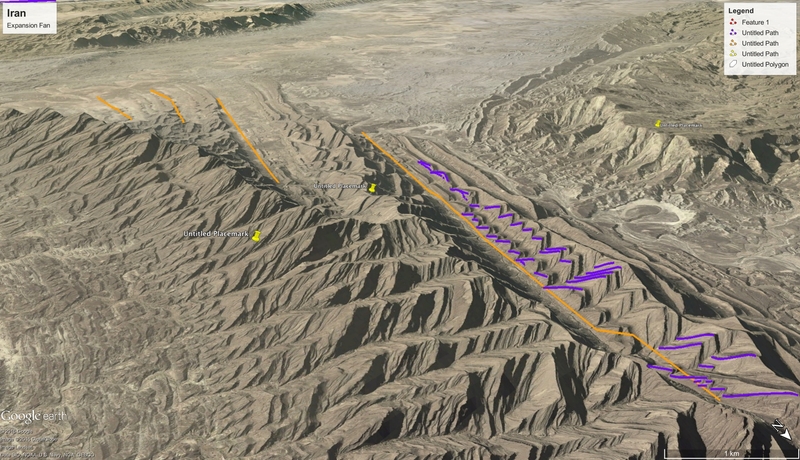 If you'll click the "enlarge" button, and look at the top of the peak, you will see triangle formations beginning near the top of K2 , on the left side of the photograph, and going down the mountain side making larger and larger triangles, in a curving line of pyramid shapes. 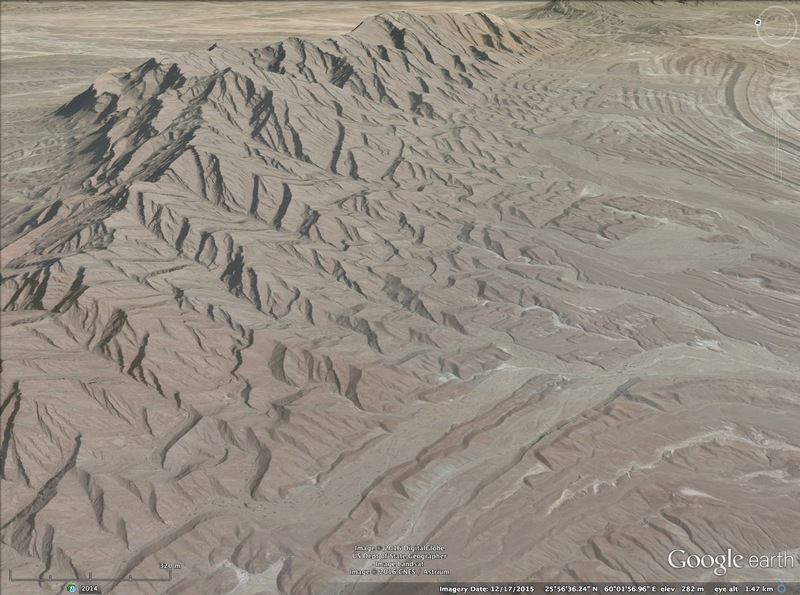 Tell me how any manner of "erosion" can make that formation happen on K2. Simple, Andy, thanks to your educating me... In the case of volcanos the shock producing events happen inside the "mountain" instead of building it from the outside, so the throat should reasonably display shock effects.